You wake up, take an overindulgent stretch, rub the sleepy from your eyes, wiggle your toes. Flip on the coffee and take a luxurious look around. It’s time for work! When you work from home, there is a lengthy list of wonderful attributes and it can be equally challenging not to fall into the slump of crinkled sweatpants, unwashed hair, and endless peanut butter and jelly sandwiches. Working from home can be an empowering and more flexible situation that increases your creativity and lessens your stress, but how can you balance the productivity of a successful mission-filled day with the call of the midday nap? 1. Set a schedule that works for you. This is one of the most wonderful perks of working from home: you choose when the work takes place. If you’re more clear-minded and efficient in the morning, then schedule your work hours around your productive hours. Setting a schedule, and sticking to it, will help you deliver whatever product you are working on in an efficient and timely manner. 2. Practice maintaining your habits. It can be easy to “negotiate” yourself out of the office hours you’ve set, but that can eventually lead to you not trusting yourself to stick to something you’ve set! And when you’re in the working world, you need to trust yourself to meet the personal deadlines you’ve set as much as your employer or team needs to trust you to meet those deadlines. Setting healthy and productive habits and practicing maintaining them will help you stay firm on what you’ve set. For example, if you’re going to wake up, do yoga, and then start working at 9:00am sharp, do exactly that for at least 30 days so the habit “sets itself” in your mind and body. Then, make sure everyone else in your life knows your schedule so they and you can respect it and honor it. 3. Establish a clean and clear work environment. When you enter into this environment, your mind and body will get the message: it’s time to work. Having the work space be clear allows you the room to do whatever that day will require of you. It also clears your mind from real-world chaos and fine tunes it to the work flow you’re focused on. 4. Dress for the occasion (and shower). Switching out of your “home” clothes to “work” clothes will also send the message to your mind and body that it’s time to work. Your role has changed. While dressing for work can be difficult when you’re in your own home, it helps to set a tone and pace. Dress as if someone could ask for a meeting at anytime—via online or in person—and you would be ready! Also, go ahead and shower. It’s easy to throw your hair in a bun and leave it alone for the day, but showers help us find our zest! They awaken our senses and have the power to make you feel brand new! How can you balance the productivity of a successful day with the call of the midday nap? 5. Have a planner or calendar that works for you. All planners are different because all of our brains are different. Figure out what works for you: Monthly? Weekly? Daily? How do you need to monitor your work flow and how can a planner help lay out that work flow? Finding a successful planner will help you thrive since there can be a challenge of mentally switching off “home” when you’re working from home. Differentiating the needs in a planner, perhaps even two separate planners, will help you maintain efficiency and clarity. 6. Continue to invest in your personal growth. When you work from home, it may feel difficult to feel “professional” some days. But you are a working professional. Seek out opportunities for your growth in whatever field you are working in. Look for online or local workshops in your community. Invest in books that will help keep you challenged and inspired. Write down goals you have for yourself personally in your professional role. Days can feel as if they just come and go and you haven’t left your home! Understanding the coming and going of days, weeks, and months will help you see how much you have done. Find a way to track your progress that works for you: checking off a list; assessing your goals; tracking projects short-term and long-term; writing down everything you’ve accomplished each day or each week. When you can look down at a physical notebook or tracking mechanism, you can see time passing and how you spent it. Perhaps try breaking down your days: morning, noon, and evening. What did you accomplish in each slot of your day? 8. Stay physical and stay involved. No matter what your work schedule, you have to get out and move! For people who work in offices, they may plan their gym trips or social happy hours around their work schedule since “they’re already out.” For people who work at home, it can be challenging to get out and stay out for the purpose of physical or mental health, but it’s important. Go on a walk, spend time at the gym, meet up with your friends, peruse the library, go take a yoga or spin class. Getting out and getting active is key to you remaining a healthy, happy worker. Confession: I turn music on and dance around until I break a light sweat and regularly attend local events to feel connected. Clearing is a concept taught in life coaching. It means getting everything out that could potentially distract you emotionally, physically, or mentally before getting down to working. For work-at-homers, clear your space, clear your mind, clear your emotions. This can take different shapes for each person. Some people meditate; some people pray; some people vent or write in their journals. Clearings help us emotionally unload so that the fragments aren’t irritating us throughout the day. When you work from home, you may feel like your work isn’t recognized or celebrated. Prevent that from happening by designating rewards for yourself: a massage, a warm cup of tea, a private dance party for yourself, a cookie. Figure out what makes you feel good to celebrate the small wins throughout the day and then take the time to partake in them! Because wins feel good and you work from home, so go ahead! Toss that hair, dance that dance, eat that cookie, drink that tea! Flexibility is the absolute best attribute of working from home and finding the structure within the flexibility will help make you more efficient, more focused, more productive, and leave you motivated. Work can be done anywhere, and when you work from home, you see how wonderful the flexibility can be but you can also see how blurry that space between work and home life can get. 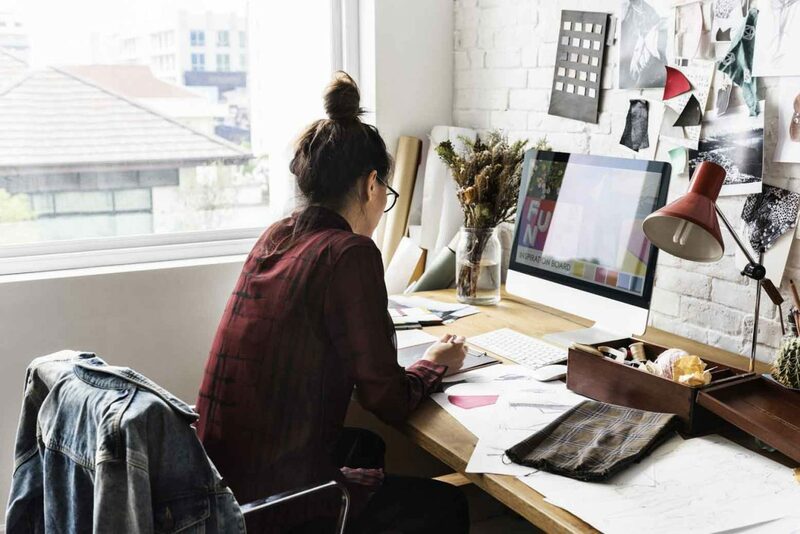 Following those guidelines will help you establish a space, a zone, and a timeframe that works for you and for your work flow. You’ll also like 2 Simple Secrets to Long-Term Success, 10 Behaviors Found in the Inspired Woman, The 6 Qualities That Make a Female Leader Strong, How to Get Honest About Your Dreams and Thrive!, and Can You Deviate From the Corporate World and Be Successful?